My new range Abbie will be releasing over this coming month, depending on where you are in the world! I wanted to share with you some info about the range and the projects you can make with this collection. I am so excited to see what projects everyone will make. Abbie is a collaboration between myself and Gabrielle Neil. Gabby first started working for me back in 2014 and she fell in love with textile design. She worked on creating the Abbie illustrations, and together we began creating a collection of coordinating prints. However it was not meant to be, and Abbie was added to the ‘one day’ pile and forgotten about! Last year we found the original drawings and gave Abbie a makeover – all new prints and a trending colour palette. The soft blush, blue and grey tones work beautifully together to create a classic collection with a modern, feminine touch. 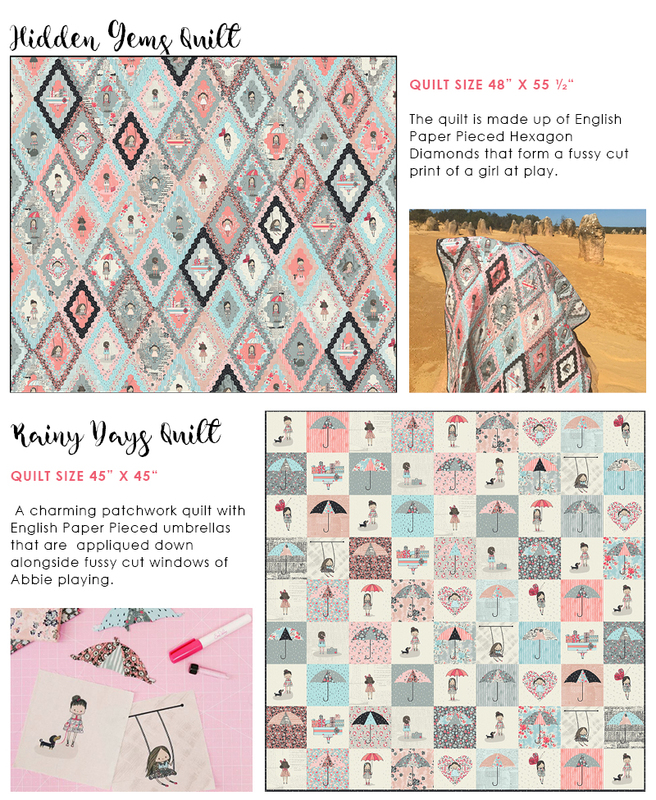 Several of the secondary prints were inspired from a reproduction quilt I have in my collection, and to complete the Abbie range we combined these with the contemporary style that Gabby loves to work in. 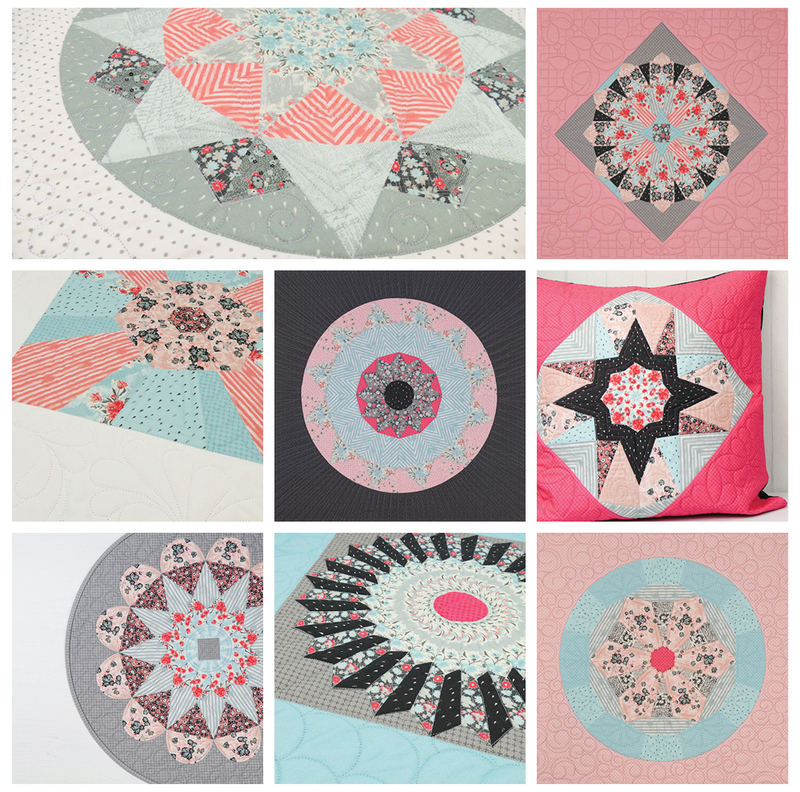 To see the aesthetic of these prints together, we mocked up some rooms using the prints and quilt projects – they look great don’t they? I hope these inspire you to see how you could incorporate Abbie when decorating a space. Abbie features sweet illustrations with textured florals and low volumes perfect for styling any girls room – include the main print for a younger aesthetic, or just use the coordinating prints for a more sophisticated look. The prints in Abbie work beautifully with the new Riley Blake Linen and other basics such as Kisses, Hashtags and Confetti Cottons. Please see the bottom of this post for stockists and distributors. 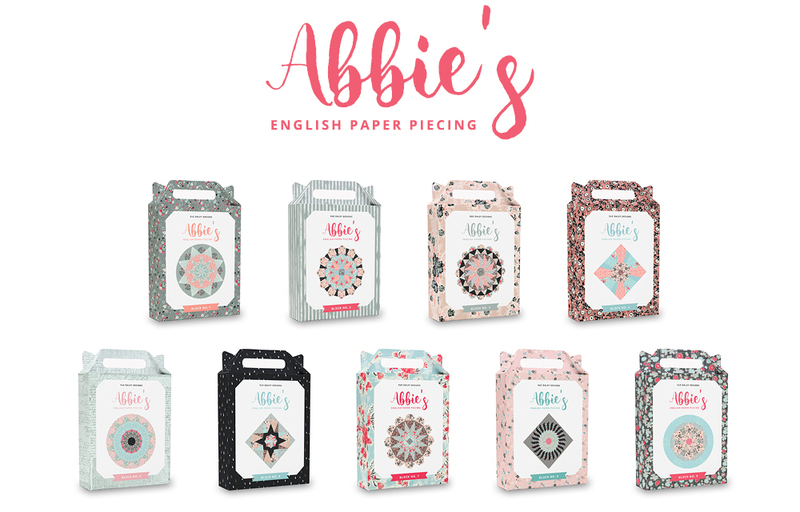 Abbie’s English Paper Piecing packs are limited edition EPP packs that include instructions, pre-cut paper shapes and acrylic templates. There are 9 different designs, each a new unique design only available in these packs. The blocks are ideal to appliqué on to an 18” square. 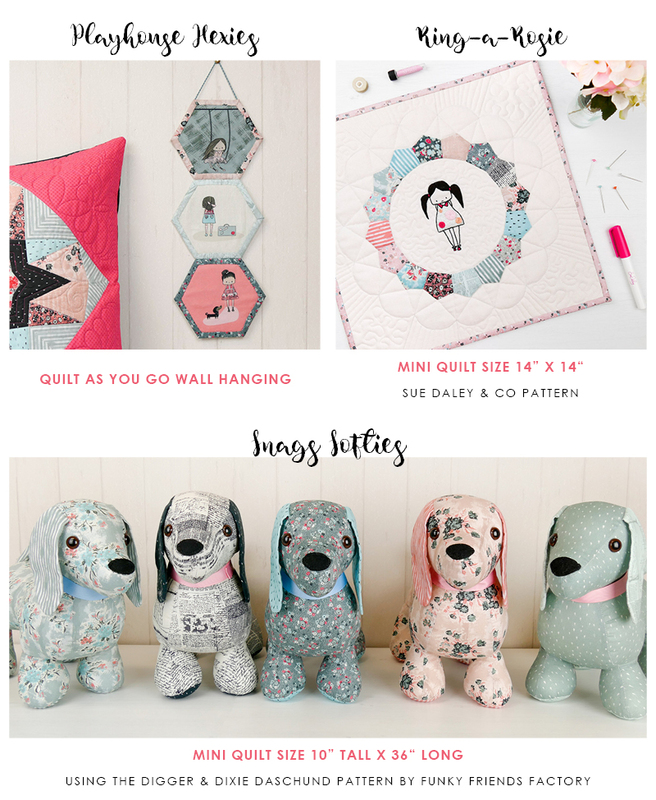 Make 9 for a quilt, join 3 together to make a runner, or just make 1 for a cushion. The possibilities are up to you! Add sashing, snowball the corners, add some appliqué – whatever your creative mind desires. 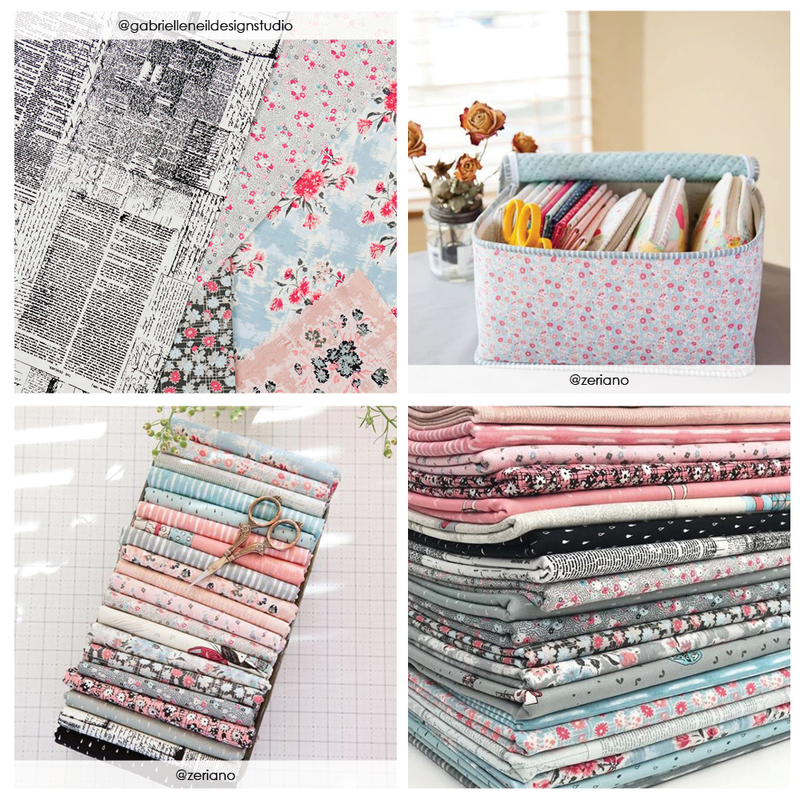 Included in each pack are instructions to make a 9 patch Abbie’s EPP quilt (shown below) if you need a specific project in mind, however of course I encourage you to have some fun with these packs and create your own masterpiece. As I said before these are limited edition packs – we have only produced limited quantities of each pack so make sure you don’t wait too long if you want to get your hands on one. 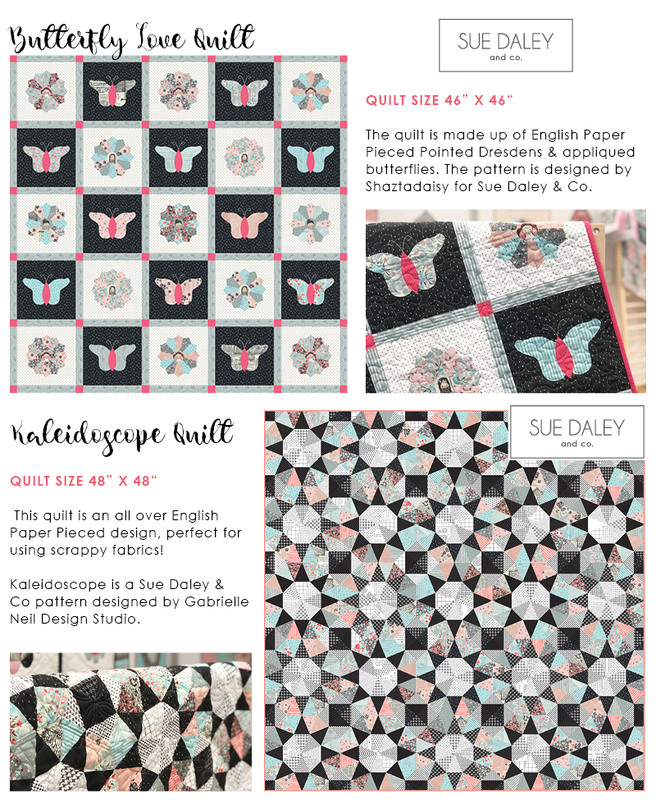 Abbie’s EPP quilt instructions included in each pack – the quilt will look different depending on your chosen pack. 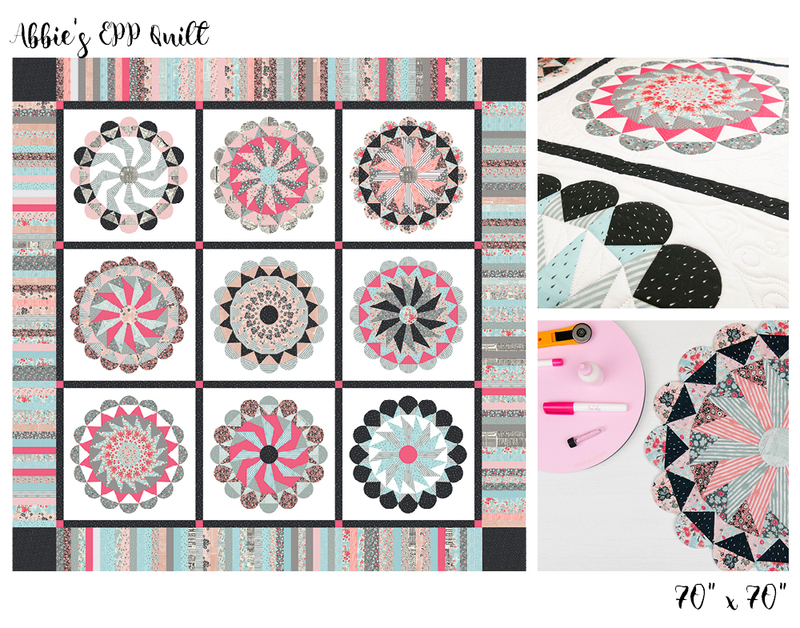 You could even purchase multiple packs and alternate the EPP blocks in the quilt for a different look. Quilt shown above uses Pack #3. These packs are also available as a Block of the Month! Make sure to enquire at your favourite quilt shop if you want to participate. 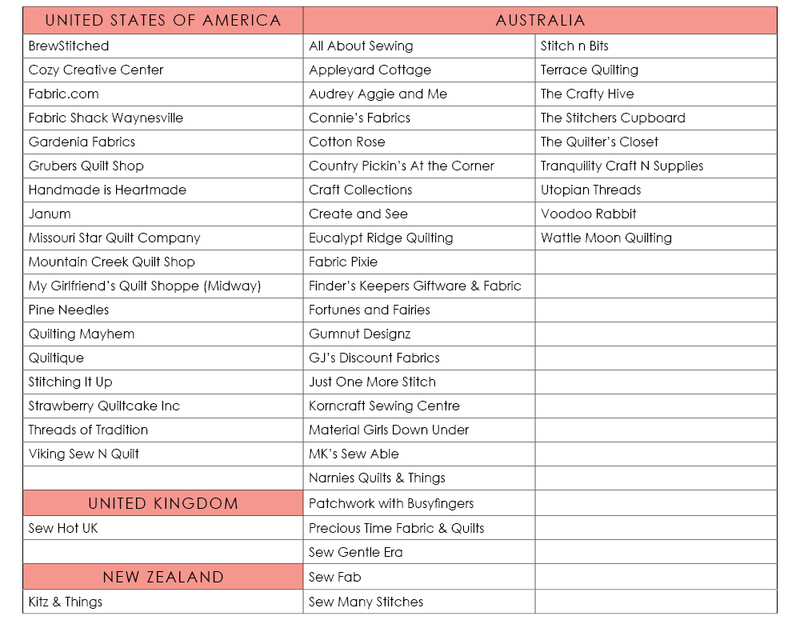 If you are a shop interested in stocking Abbie please contact one of the following distributors for your country. I hope you like this collection, I look forward to seeing everyone working on it. If you do create any projects with the Abbie range please be sure to tag me on social media and use the hashtag #abbiefabric as well!